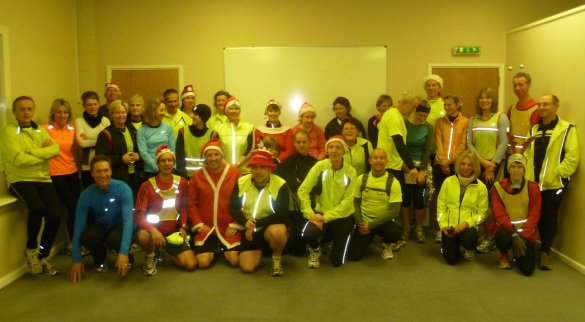 The club met at Honiton Sports Centre for the last time as we gathered before the annual Christmas Lights run. Then it was off to Pete and Suzanne's for mulled wine and mince pies, going via a lights hotspot in Livermore Road. Then a jog round looking at other displays before finishing back at John & Judy's for more mulled wine and snacks. Next year we will be meeting at Honiton Community College. To recover from the excesses of the Honiton running Club Xmas meal the night before several club members woke up and decided to head for Otterton in the rain to tackle a muddy 10K described as the ‘Reindeer Run’ last Saturday. Luckily as Roger the weatherman turned up they knew the weather was going to improve and it did though there is a very slippery muddy stretch on this run. Richard Harris turned up sporting a huge pair of golden antlers complete with jingling bells and was the first Honiton runner home in 33rd place in a time of 45:58. Roger Saunders finished in a time of 49:17 closely followed by Pippa Westall in 49:42 who almost caught him. John Burgess made a great effort to come home in 51:31 almost a minute ahead of Nick Bradley Carter in 52:23. Olivia Higginson sporting a lovely pair of fairy wings to assist her finished in 56:44. Finally Sarah Walker who is back running again got tangled up with a Christmas tree and fairy but recovered and came in at 1:06:16. Mulled wine eased the tired legs at the finish. The race was won by Laurence Bollam of Sidmouth RC in 31:04 and there were 177 finishers. The 3K fun run had an impressive 134 mostly junior runners, the sole Honiton runner was Rowan Westall who came in a very good 4th in 14:41. Thanks to Sidmouth Running Club for putting on the events. Nikki and Julian try not to laugh as they get involved with one of Mickie and Brent's mad party games at the club Christmas Meal, and Ceri is triumphant having stacked 8 small nuts. Nick has to keep his mouth shut for once as Sarah stacks sugar cubes on the end of his tongue - sorry ruler. Mickie is smooching up to Brent while trying to pass him a polo mint If you were hoping for a quiet relaxing evening you were in for a shock. Most of the happy throng staggered out of The Tumbling Weir through exhaustion rather than from too much booze. An excellent time was had by all and grateful thanks to Mickie for making all the arrangements. More photos on photo page.